In case you aren’t familiar with Wohler’s Report it’s a publication out of Wohlers Associates Inc that “provides a review and analysis of additive manufacturing and 3D printing worldwide.” The 2013 edition was recently released, and the 297-page color report marks the 18th consecutive year of its publication. Though the company consists of only four employees, the 2013 report came together with input from nearly 60 “co-authors in 21 countries, 74 service providers, 31 system manufacturers, and many others worldwide.” Needless to say, it’s an information-dense PDF, filled with charts, graphs, and pictures. Because it’s $495, I can only afford to read the table of contents. As such, I’ll be heavily quoting those that have read beyond the first page. Michael V. Copeland wrote on Wired that “Buyers hit the brakes on purchasing hobbyist 3-D printers in the past year, even as industrial-grade printers are playing a larger role in manufacturing finished parts rather than prototypes.” In a total 3D printing hardware and services market that broke $2.2 billion in 2012, $617.5 million of that was attributable to sales of printers. Only $40 million of that was for printers in the sub-$5,000 category. I do wonder, though, if that figure also takes into account crowdfunding efforts like Kickstarter campaigns, which tally to about $5.5 million for 2012. While growth of sub-$5,000 printers went from tripling each year in 2008-2011 to 46% for 2012, it’s still growth. More people are buying them this year than they were last year. 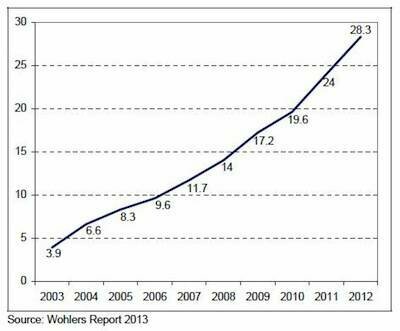 And there was barely a hobbyist 3D printing market pre-2008, so any growth appears huge. It’s also important to note that the entire market grew 29% from the $1.7 billion of 2011. In summary, the additive manufacturing market is growing nicely. As a percentage of sales, professional and industrial machines are greatly outpacing home 3D printers. Still, personal units are selling at higher rates than in previous years. My own opinion is that the slowdown in growth is partly due to a group of people that are waiting for more printers with pleasing aesthetics and intuitive GUIs like the Form 1, the Zortrax M200, and the Cube to become available. These people are just learning that personal 3D printers exist and that they can afford them, but they don’t like the look of RepRaps and/or the complexity of operating them. As more user-friendly printers hit the market I think growth will reaccelerate in the home 3D printing sector.